Almost three years since we reviewed the original version of Vic Keary's impressive summing mixer, it's time to test-drive Version II — and a special Limited Edition. 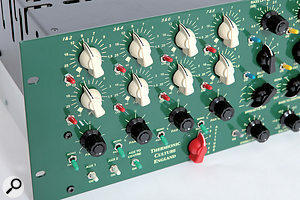 British manufacturers Thermionic Culture offer a comprehensive range of valve recording gear. One of the key elements of their design philosophy is the employment of vacuum tubes (otherwise known as 'thermionic' valves) in the active stages of their gear. You won't find any solid-state semiconductors in the main audio signal paths. They also have a reputation for making unique (and sometimes downright quirky!) design choices. The often fruitful results of the outside-the-box approach to design combine with their purist approach to the signal path to make their gear stand out from the competing crowd — and the Fat Bustard II summing mixer is no exception. Essentially, the Fat Bustard II is a 12 x 2 summing amp with two further aux inputs that can be used during mixdown. The name Fat Bustard is a multi-faceted wordplay: as well as being in keeping with Thermionic's ornithological theme (other gear includes the much-admired Culture Vulture, the Freebird, The Rooster, the Pullet, the Nightingale... I could go on), it hints at the basic functionality of mixing — or busing — audio signals together, and also describes the more robust, if not aggressive, sonic effects (at least when overdriven) of the valve circuitry employed on the stereo bus. This basic outline, though, tells only part of the story, both because there are different iterations of the Fat Bustard, and because there's so much more to the processing than aggressive distortion. The only difference between the latest revision of the original Fat Bustard, (introduced in 2007) and the standard 'II' version is the addition of a monitor section. Independently from the main output, the signal can be sent either to a pair of speakers or to an external monitor controller. The Fat Bustard II monitor section boasts not only a monitor-level control but also the ability to switch the monitor path between the Bustard's own output signal and an external stereo input, which may, for instance, be used for DAW foldback. The 'Limited Edition' (LE) version — the review model that's sitting on the test bench as I write — can easily be distinguished by the face plate, which is painted a very slightly brighter green than the classic British Racing Green. Again, there's only one difference between the 'stock' Fat Bustard II units and the Limited Edition (of which Thermionic Culture intend to build a maximum of 99 units), which is that a different set of valves is used in the first amplifier stage. Whereas the regular 'blackface' version employs a pair of 5965 dual triodes, designer Vic Keary chose to use two 6072/12AY7 dual triodes for the LE. According to Keary, these offer slightly better noise specs and superior (in other words much less) microphony. The 12 channels are divided into two groups, one comprising four stereo and the other four mono inputs. Each channel has an on/off toggle switch and rotary level control (a detented potentiometer, ranging from minus infinity to 0dB in 21 steps). The mono channels may be panned from left to right, and although the pots aren't centre-detented, they can be switched off to place a signal in the centre. Two further aux inputs have no dedicated level controls but can be activated independently, and may be panned hard left/right or routed to the centre. These aux inputs can be used for any line signals, but if you want to increase the channel count, they can be used to accommodate the output from Thermionic's 2U Little Bustard (which will shortly be discontinued but, I'm told, only to make way for a successor some time in 2013). All signals are fed into the passive summing bus, which flows into the tube stages for gain make-up and processing. There are five valves, all of which are dual-triode types, providing five active stages for each of the two output channels. That's plenty of power for the various tone-shaping duties, especially given that no mic signals need amplifying. Stereo controls govern each processing stage, so both output channels are affected simultaneously, which I find very beneficial. 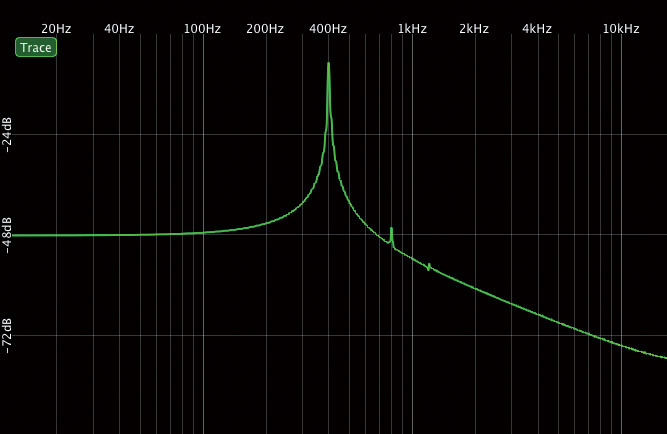 The first stage is a two-band EQ with bass lift (50Hz, up to 10dB gain) and top lift (10kHz, up to 12dB gain) bands. Both feature Thermionic's 'varislope' curves, the steepness and shape of which change according the amount of gain applied. Their active design uses feedback in the first triode stage of each channel's 6072/12AY7 valve. The second triode element is reserved for the Attitude control, whose 'dangerous' nature we are unmistakably warned about by its red knob! This circuit is as simple as it is effective. The six-step rotary switch reduces the amount of negative feedback in the triode stage by up to (approximately) 12dB. 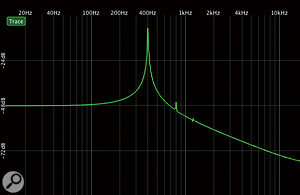 In turn, the signal gets louder and the saturation characteristic of the valve stage becomes more prevalent. It's worthy of note that this saturation stage generates an absolutely beautiful, rich-sounding harmonic spectrum with a lot of second-order harmonics, a few third-order harmonics and virtually no higher order overtones; in fact, this is a textbook example of a well laid-out triode valve saturation stage. Two beautiful VU meters display the output level. After the Attitude stage, the signal runs through passive bass- and high-cut filters, which are intended to be used in conjunction with the lift EQ described earlier. Each cut is controlled with a six-position rotary switch. The first three positions of the bass-cut control select a 6dB/octave high-pass filter, which rises in frequency as the control is increased. Positions 4-6 activate a shelving curve, whose corner frequency also rises as you turn the knob clockwise. The high band operates in the opposite manner. These shelving curves, when used in combination with the lift filters, allow an effect similar to that for which the venerable Pultec EQP1A is renowned. For example, in the bass band, the cut operates at a slightly higher frequency than the boost, resulting in a 'dip' just above the boosted frequency. Effectively, this translates to the low mids becoming clearer while the fundamental bass range is pumped up. The Fat Bustard II is not capable only of altering the harmonic content and the frequency spectrum of your mix, but also of manipulating the stereo field. There's a stereo spread control, which widens the image by simultaneously decreasing the Mid and increasing the Side portions of the program material. A bandwidth switch may then be used to control the frequency range affected by the spreader. At its lowest setting, the spreader is effective on the entire frequency range, but there are also three high-pass filter positions, allowing the user to widen only frequencies above 100Hz, 250Hz or 3kHz. This is a very powerful control: when used across the entire spectrum and with the spread control turned up to the maximum, the signal will be almost completely out of phase, so it must be used with caution! Some of the spreader's effect can be tamed, as there's a 'Bass to centre' switch, which renders all frequencies below your choice of 100 or 200 Hz mono. Additionally, it can be used across the full spectrum, making the whole mix mono. 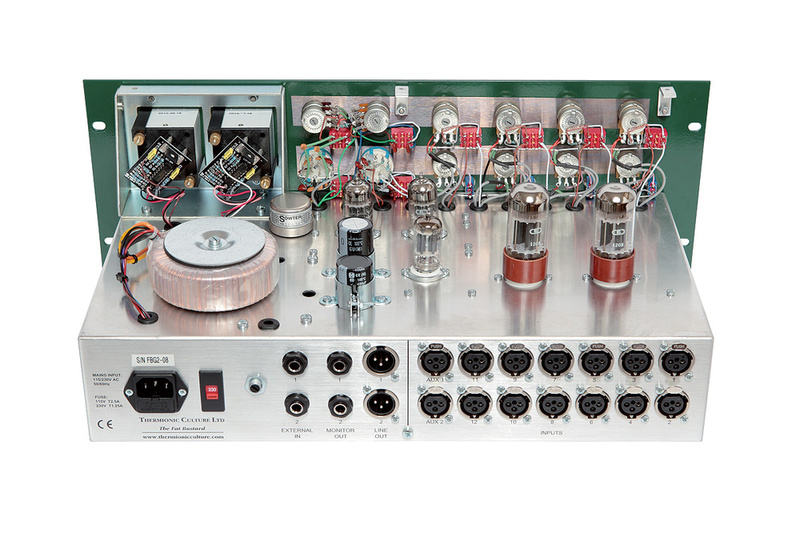 The entire stereo spreader section is powered by a single ECC82 valve, another dual triode that provides an active element for each channel. A detail I found interesting was that the bass frequencies in the 'Bass to centre' circuit are tied together via a massive inductor manufactured by Sowter. Finally, the program is ready for the output stage. It passes the master level control, a high-quality, 24-position rotary switch manufactured by ELMA, and is then fed through the output valves, a pair of large 6SN7 dual triodes, one for each channel. On both channels, the signal is fed through their two triode halves in parallel, resulting in higher headroom and a 'punchy' tone. It must not be forgotten that there's also a balance control offering a range of ±1.5dB. Finally, this opulent set of controls is made perfect by the two controls of the monitor section: a level pot and the internal/external switch. The construction resembles the layout of a typical guitar amp head. The transformerless circuitry employs five dual-triode valves of various types. Of course, there's also a power switch, accompanied by a large green status light. This, by the way, may be the only visual sign of the unit working in a dimly lit control room, as the two (albeit beautiful) VU meters don't have background lights. The construction of the chunky 4U enclosure reminds me of a typical guitar-amp head, with a chassis containing all the neatly executed point-to-point-wiring. 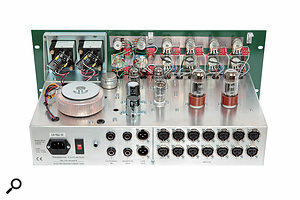 On top of this chassis, behind the face plate, there's ample space for all the bulky parts, such as the five valves, the Sowter inductor, the massive toroidal mains transformer and two large electrolytic caps. Both VU meters rely on IC-based drivers mounted on two little PCBs, but this is nothing that should bother even the most purist of valve enthusiasts, as the presence of these ICs has absolutely no effect on the sonic qualities of the unit. If anything, it helps to keep the production costs down. Generally, the build quality is of a very high standard, and it feels like there's the right balance of 'good old-fashioned' features, such as the point-to-point wiring, and modern standards, such as a power supply that can be switched between 110 and 230V, or the possibility to active/deactivate all input channels and processing stages individually. However, I do have some criticisms. Although they have a very smooth action, the level pots of the input channels feel a bit weak in comparison to the ELMA output-level switch. To some extent, that's understandable, as the latter is of the highest quality — and cost — available, but given the Fat Bustard II LE's price tag I'd have loved to see more rotary switches instead of the detented pots on this mixer. Also, the balance pots do not offer centre detents, which is a shame — but, following my feedback, it's something that Keary has said he'll consider adding to similar units in the future. The audio connections, all presented on the rear of the case, comprise 16 XLR sockets, catering for the 14 inputs and the main stereo output, and four TRS jacks, for the monitor output and the external monitor signal (DAW foldback) input. There's also a trim pot, which can be used to set the relative level of this last input. Interestingly, as on some other Thermionic Culture units, all the audio connections are unbalanced: there are no audio transformers or other balancing circuitry in any of this mixer's sections. This is actually a more common practice than you might assume, particularly in high-end equipment (for example, the Pendulum Audio OCL2 Compressor is unbalanced throughout), and for good reasons, the main one being that the shorter the signal path, the more pristine the sound. In addition to their more practical attributes, such as balancing and galvanic isolation, audio transformers are often used for deliberate, albeit subtle, coloration of a signal. If your aim is to avoid coloration, then, it makes sense to avoid transformers where possible — and many world-class mastering facilities run entirely unbalanced signal paths, often using bespoke or modified gear. Also, you'll find that internal signal paths in most audio equipment are also unbalanced, even when the I/O is balanced — so pretty much the only advantage of balanced I/O stages (other than achieving desired sonic coloration from transformers) is the possibility to install longer cable runs without picking up interference, which, of course, comes at the cost of much longer signal paths. It follows from this that unbalanced connections used in a well-designed environment with a proper grounding scheme can have great advantages over balanced cable runs. The Fat Bustard II LE offers you an extraordinarily short, elegant and pristine signal path, with just the possible caveat that it might require a bit more care to connect this mixer to the outside world than your conventionally balanced equipment does. I should mention that Thermionic Culture offer transformer balanced inputs and outputs as a cost option (approximately £80 per channel — quality transformers aren't cheap parts!). The 'Attitude' effect is a textbook example of triode-valve saturation, with a lot of second-order harmonics and a little third-order harmonics, but virtually no higher-order overtones. During my test drive, it became apparent quite quickly that the Fat Bustard II LE is a very special bit of kit. It sounds lush and huge. The combination of the passive summing bus and the various tube stages can handle even the strongest bass and transient-heavy program material: the image remains solid and stable, even in the most demanding cases. It's a real challenge to put these — sometimes subtle, sometimes not so subtle — effects into words, but no matter how you look at it, summing a production with the Fat Bustard yields a very deep and wide sound picture. Some fine spatial details seem to be revealed, and the production feels really alive and 'tangible', with boldly drawn contours and a beautiful physicality. When discussing a couple details with me, Vic Keary talked about the "raw power” of the two 6SN7 output valves, whose four triode elements (two in parallel per channel) are acting as cathode followers — which means that they are simply converting the impedance of the output signal without adding any gain at all. I can't think of a more appropriate description for the sonic qualities of the Fat Bustard II than those two simple words. This isn't an entirely transparent-sounding processor, though, as its most important ingredient — the thermionic valves — do impart a certain character, 'rounding the edges' off the program material to some extent. That's not a criticism, by any means, as it's a pleasant effect, but if you're looking for the finest transient response, you might prefer to look at solid-state devices from the like of SSL or Speck Electronics. Despite its relatively simple set of controls, the two-band EQ is an amazingly powerful and versatile tool. It takes some time to explore fully the variety of curves that can be achieved when combining these with the bass and top cut filters, but when you acquire mastery of the controls the results are great. As I hinted earlier, the filter section can be set up so that it produces the typical lower-mid dip above the bass boost, and it sounds as rich and smooth as one could wish. No less important is the Attitude control, and this is for two reasons. First, this is the only stage in the Bustard's signal path where the gain can actually be increased. Due to their passive nature, there's no gain in the input channels, and for the reason discussed two paragraphs above, there's no gain in the output stage either (as Vic Keary greatly prefers the sound of the output valves in their simple cathode-follower configuration). The real key to the Attitude circuit, though, is the beautiful-sounding harmonic spectrum it can generate. It oozes valve goodness, without adding any harsh or dissonant artifacts to the program material. As much as I like the sheer tonal qualities of the Fat Bustard II, though, this unit can be a real 'diva': for all its unique strengths, it can be pretty difficult to deal with. For instance, I found it quite complicated simply to establish a unity gain path through the entire unit. Due to its unbalanced inputs and outputs, there might be a 6dB insertion loss, depending on the layout of the I/O stages of the equipment the Fat Bustard is connected to — and there's no 'clean' gain available to compensate for this (there's no gain in the input and output stages, and the Attitude circuit deliberately changes the timbre). Likewise, the stereo spread section (which generally does a very good job) causes a level drop of 1.5dB. According to Vic Keary, this cannot be completely compensated for with the existing circuitry, so it is something we have to live with for the time being. Thermionic often make tiny improvements to their products over the years, without formally launching a new version, and I was pleased that Vic Keary took many of my comments on board as we discussed issues I'd encountered during my tests. For example, I'd discovered an unexpected level drop when engaging the pan controls on channels 9-12, and this will be tackled on the next production run. Similarly, all production units from now on will have pan pots with centre detents, which will make it much easier to reset them. There will also be an improvement to the Attitude circuit: after discussing the topic of gain staging, Keary found a way to increase the gain of the circuit by another 2dB without compromising the sound quality. Last, but by no means least, the unity gain setting on the Attitude switch on all future units will be '1' instead of '2'. Thermionic's Fat Bustard II is a truly unique beast. The construction generally seems reliable and sturdy, the unit has many great-sounding tone-shaping facilities, and the combination of passive summing and the unusually laid-out valve stages ensures a rich and huge sound picture. 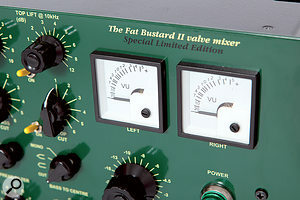 There are countless summing mixers on the market, but none compares directly with the Fat Bustard II. Passive summing can be achieved with the simple and affordable Roll Music System 216 Folcrom, in combination with a stereo (perhaps valve) preamp of choice for gain make-up. Those interested in valve signal paths on the mix buss can find offerings such as the innerTUBE Audio Sumthang, Manley 16x2 Line Mixer or the Tube-Tech SSA2B. Both the Neve 8816 Summing Mixer and the SPL MixDream offer stereo width enhancers, and the SPL also features other sound-shaping facilities as well, such as a peak limiter. Ample processing facilities on the stereo bus, including passive EQ, valve saturation and stereo width controls. Balanced I/O is a cost option. The Fat Bustard II is a well laid-out, solidly constructed and great-sounding summing mixer, and it offers many special processing features. 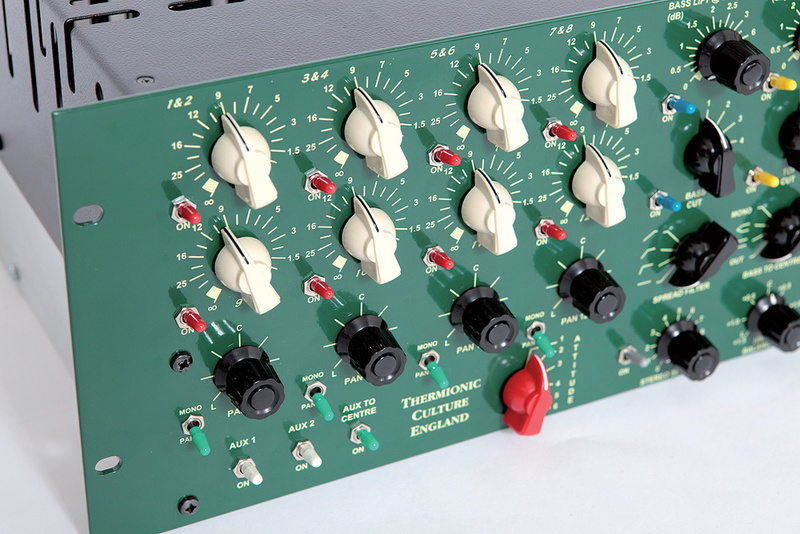 It would make an ideal sidecar mixer — or even a studio centrepiece for the demanding valve-sound connoisseur. Limited Edition and Standard Edition, £4260 each. Prices include VAT. Thermionic Culture +44 (0)1279 414669. Limited Edition and Standard Edition both £5690 each.